With vast areas of national parks and protected land, Costa Rica is an outdoor adventurer's dream and a mecca of ecotourism. Costa Rica hotels and resorts are as diverse as the natural beauty that surrounds them. From luxury accommodations in the rainforest to quaint beachside hotels, your options are unique and plentiful. Experience the city with a San Jose hotel, or choose an all-inclusive resort where meals, drinks, and activities are included amenities for an ideal Costa Rica all-inclusive vacation package. This tasteful, cosmopolitan hotel appeals to spa-lovers, couples and active travelers alike. 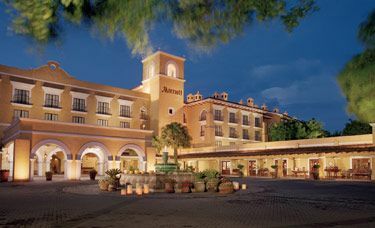 This premiere hacienda-style hotel boasts distinctive facilities and a convenient location. Hotel Riu Palace Costa Rica, is located on the edge of the beach of Matapalo. Create your ideal vacation package to a destination that is home to rare wildlife, lush forests, beautiful surroundings, and non-stop family fun. Your Costa Rica vacation package is only a click away with Southwest Vacations®. Travel to Costa Rica to experience this unique destination featuring wild rainforests, beautiful beaches, amazing volcanoes, and a rich diversity of wildlife. Costa Rica offers miles of undeveloped natural landscapes, great year-round weather, and an abundance of travel activities for the perfect vacation. Your Southwest Vacations package to Costa Rica is sure to create lasting travel memories. Costa Rica is a favorite vacation destination that is overflowing with attractions, activities, and opportunities for fun. It’s also the perfect vacation destination if you are interested in an ecotourism trip. Enjoy exciting excursions and take tropical tours to complete your Costa Rica vacation package. Start by exploring the city of San Jose, Costa Rica’s bustling capital city with stylish hotels and Spanish colonial architecture. San Jose attractions include museums, art galleries, and coffee plantations. Visit the active Arenal Volcano and then enjoy the nearby hot springs and other classic Costa Rica activities such as river rafting and zip-lining through the rainforest. Experience the best of Costa Rica’s natural landscape and visit the biodiversity of Manuel Antoino National Park, which includes spacious rainforests and beaches to explore. Visit the protected sea turtle nesting area at Tortuguero National Park. Looking for more adventure? Go out on the water to catch a trophy fish with some of the world’s best fishing excursions, or take a surf lesson in Costa Rica’s world-famous waves. Stay on land and take an off-road ATV ride into the jungle, or hike through Costa Rica’s incredibly well-preserved natural terrains. Add any of these great Costa Rica activities and Costa Rica tours to create your perfect Costa Rica vacation package from Southwest Vacations. Flight service to San Jose may vary based on departure date and origin city. View our flight information, so you can vacation with ease.